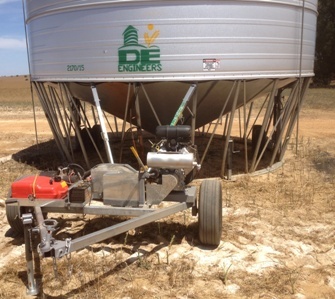 DE Engineers Engine Drive and PTO Bulldog plants are built to drive 15″ field bins augers without belt slippage by using our unique “over-centre’ belt tensioner and are strong enough to stop and start 15” Field Bin augers when full. PTO drive units are standard with hydraulics to operate the hydraulic wheel lift on field bins and can be fitted with the our remote control “Electro Clutch” (pat pending). DE Engineers ‘Engine Driven’ stand-alone Field Bins are fitted with a 35hp Kohler petrol engine, hydraulic power pack and can also be fitted with the our remote control “Electro Clutch” (pat pending).